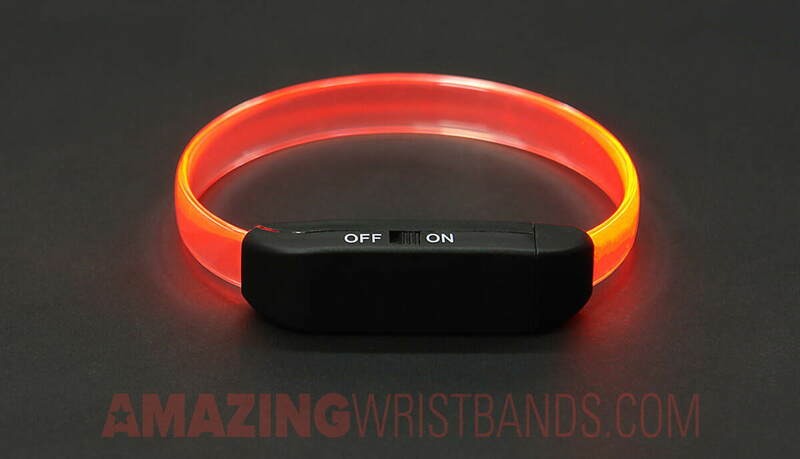 Amazing Wristbands is excited to offer our newest product, custom glowing and flashing LED Wristbands. Add your message or logo to our amazing LED wristbands and see the design light up and glow! The message is laser etched onto the inside of the band and when illuminated by the LEDs the bands will glow and the message will shine brighter and more brilliant than the rest of the band. These bands are truly amazing and sure to draw attention. Choose message style...DebossedBlank - No Minimum Qty. Colors - LED and Case What's this? Our LED bracelets are offered in 2 distinct formats. Standard Style Glow & Flash and Sound / Vibration Activated. Standard Style Glow & Flash LED Wristbands - These are the standard style of our LED bands and can be used in 4 modes. Each mode is activated by pushing the button on the top of the case. We offer 8 LED Glow Colors, including multi-color changing and 7 Case colors including transparent, which allows the LED Glow color to illuminate the case. Mode 1 is solid glow / Mode 2 is rapid flashing / Mode 3 is slower flashing / Mode 4 is Off. 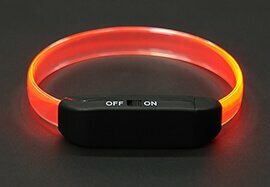 Sound / Vibration Activated LED Wristbands - This style of band is truly a blast to see in action. These led bracelets will flash to the beat of song or the vibration of speakers. They are blast to wear at a party or concert. They can even perform quite well as a motion activated flash if there is enough movement/vibration to trigger the sensor. The LED sensor is turned on with a simple on/off switch located on the side of the case. We offer 7 LED Glow Colors and 4 Case colors including transparent, which allows the LED Glow color to illuminate the case. Custom case colors are available upon request. A minimum quantity of 1,000 bands is required for a custom case color. Currently we do not offer custom LED colors. Screen Printed messages on the bands and/or the case are available. Please email or call us for pricing and options. Online design tools for the screen printed options will be available soon.